You are here: Home / Digital Pianos / What’s the Best Digital Piano for Intermediate Players? What’s the Best Digital Piano for Intermediate Players? 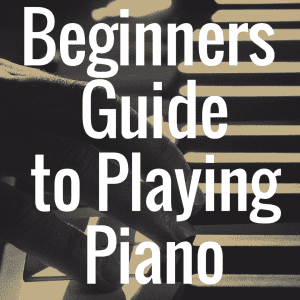 In this article, you will learn how to determine which piano is best for an intermediate level piano player. Once a player has recognized important aspects such as his or her skill set, needs, and budget, you are then be able use these factors to best evaluate what machine is right for you. While we can discuss anything from cheap digital pianos to far more expensive ones, the three key instruments we will detail today are the the Korg SP 280, the Casio Privia PX 350 (ditto for the newer PX-360), and the Yamaha P 105 (which goes for the newer P-115, as well). 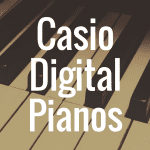 Below, check out our interactive table that compares some really great digital pianos that are fit for those with an intermediate skill level. 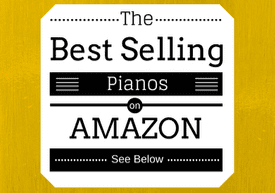 You can compare each piano based on price, average customer review rating, weight and more. 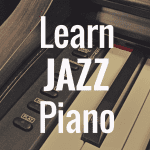 People who buy intermediate digital pianos usually have progressed further than the beginner style piano player, a person that typically is only seeking to figure out fundamental things like note letters, chords, and basic compositions. Intermediate players have more of a general knowledge of music theory and most likely have a couple compositions under their belt. They are looking for a machine that will provide them more functionality and features than a beginner slab, but will not be overbearing and overly complicated as some advanced machines are. Many intermediate level pianos have hammer action technology systems and a wider range of rhythms and tones, along with more functionality and connectivity options to other platforms. Intermediate digital pianos come in many different shapes and sizes. In fact, you can find an intermediate piano in just about every sub category that deals with digital pianos. For example, if you’re looking for an upright, there are intermediate offerings for that. If you’re looking for a stage piano, there are offerings for that. If you’re looking for a basic slab, there’s an intermediate for that, too. These pianos usually come as full-length 88 key digital pianos, as most likely by this point the piano player has progressed from a beginner stage and needs the full range of the piano to express him or herself. If you make the jump upwards from a beginner to an intermediate piano, you immediately notice the difference in engineering between pianos at these two different levels. You may notice that the notes come through a bit clearer, or are a much closer representation to real piano sounds than before. You may notice that the piano is much more responsive, or feels more like the keys on a real piano. You also may notice that structure of the piano is made better and designed to last longer. The engineering found on these pianos many times uses real samples of actual grand pianos to produce a better sound, and they come with the standard (or maybe a little more than standard) hammer action system provided by the company. If it’s made by Casio, you may find yourself with the Tri Sensor Scaled Hammer action system. Korg provides the Natural Weighted Hammer Action (NH), and Roland has the Ivory Feel action series. In terms of the tone generation, you could be dealing with the Acoustic and Intelligent Resonator (AiR) sound source from Casio, which has multi dimensional layering and morphing. Yamaha, on the other hand, has a number of different sound sources, including the Pure CF series, which uses real samples from concert Yamaha CF grand pianos renowned around the world, the Real Grand Expression system, and the Advanced Wave Memory (AWM) sampling. 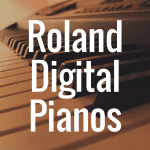 Roland has their own SuperNATURAL piano engine, which makes the notes change naturally without steps, and naturalizes the decay and sustain of the range of tones. There are a number of different pianos that can be considered when it comes to dealing with the intermediate level. In truth, looking around to see what’s right for you most likely will not leave you disappointed, seeing as how much is being offered on systems these days. One of the first options you might want to consider look is the Korg SP 280. The SP 280 is a beautiful piano that comes in either an ivory white looking color, or a black matte. It has a rounded figure and comes with a stand that easily allows for height adjustment. The display and panel of the piano feature a minimalist concept with few buttons and things to get confused on. Some may not like this, especially at the intermediate level. But I think that, if you’re just beginning to find a new instrument that’s right for you, it’s important to remember that you’re still learning and therefore the less knobs and buttons and effects you have to become distracted or confused by, the better. There is a full length of 88 keys housed here on the SP 280, with the Natural Weighted Hammer Action system to support the keys. There are different levels of touch sensitivity, corresponding to light, normal, and heavy, helping the user adjust to a setting that is perfect for him or her. The sound generation used here is Korg’s Stereo piano system, and this system is supported by a maximum polyphony of 120 voices. This piano has more sounds than most digital pianos on this level, with three banks containing 30 sounds. This piano has more than enough to offer the intermediate piano player, and is a wonderful buy for about $700. Another awesome option at the intermediate level is the Yamaha P 105 (do note, the P-115 has replaced the P-105. Click here to see our review of the Yamaha P-115). This piano has been one of the more trusted options for years. It has been called upon by many a piano player to service them in their time of need, or to help them in the transition from one instrument to another. In many ways, this piano could be your ideal intermediate digital piano. Let’s dig a little into why. This slab features a full-length 88 keyboard and comes in a matte black finish with a sleek console design. It features Yamaha’s weighted Graded Hammer Standard (GHS) key action, which is just about what you would expect at the intermediate level. For tone generation, the Pure CF system is housed on board, which is built from real piano samples as mentioned before. Other important features are the 128 notes of polyphony in addition to the fourteen preset tones and the over 50 preset piano songs. The best thing about the P-105 is that it doesn’t come at an intermediate level price, going for about $600 online. 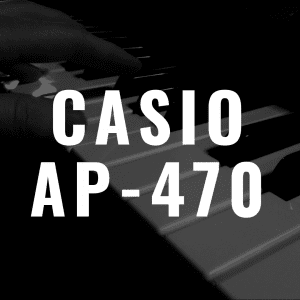 The Casio PX-350, on the other hand, would love to stake its claim as one of the best options you can secure for an intermediate level piano. The PX-350 is part of a great line of pianos falling under the Privia lineup, which is known for their exquisite line of production and performance. The PX-350 is bit of a step up from the PX-150, which some consider to be more of a beginner to intermediate option. The 350 is equipped with the Tri-Sensor Scaled Hammer Action II key system, which is one of the best Casio has to offer. This system carries some heavy machinery, as there are 3 individual sensors fitted to every single one of the 88 keys onboard. This piano also has a maximum polyphony of 128 notes, just like the P 105, but it blows the others out of the water with an assortment of 250 built in tones. That is a major selection to choose from, although some piano players may feel they don’t need all of that. The piano also has the aforementioned AiR sound source that works hand in hand with the 3 levels of touch sensitivity. Even though providing a little bit more, it still comes in at an affordable price range of $700. 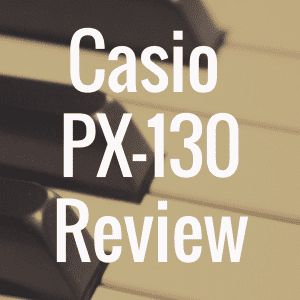 DO NOTE: The Casio PX-350 has been discontinued and replaced with the Casio PX-360, which we reviewed here. If these pianos aren’t enough, here’s a list of other intermediate level pianos that should suit you. And always remember to bookmark Digital Piano Review Guide, as we are always updating our content to better serve readers like you.